The Panamera range in Australia will expand mid-year to include two all new V6 variants – the rear drive Panamera and all-wheel drive Panamera 4. The two new gran turismos will make their world debut at the Beijing Motor Show in April, with the new models expected to join the V8 Panamera S, 4S and Turbo in Australian showrooms in late July, following a European launch date during May 2010. Both new models are powered by a brand new 3.6-litre V6 engine with Direct Fuel Injection, developing an impressive 220 kW of power and 400 Nm of torque. In keeping with the Porsche Intelligent Performance strategy, Porsche is able to combine performance with economy. With the standard PDK Porsche-Doppelkupplungsgetriebe double-clutch gearbox and Auto Start Stop function, both models consume far below 10 litres per 100 kilometres in the New European Driving Cycle: the Panamera a mere 9.3 L/100 kms and the Panamera 4 9.6 L/100 kms. Optional 19-inch tyres with optimised roll resistance reduce these consumption figures by a further 0.2 L/100 kms, giving the Panamera a CO2 rating of just 213 g/km, the Panamera 4 220 g/km. 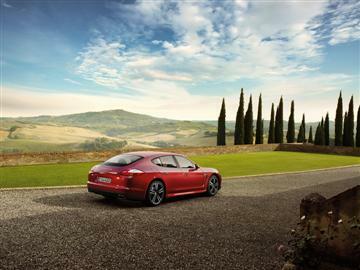 Both V6 versions of the Panamera fulfil the EU5 emission standard in Europe and the LEV standard in the United States. Intelligent performance is typified through light weight construction. The axles, doors, hood, guards and boot lid are all made of aluminium. The brand new 90-degree V6 engine built at Porsche’s plant in Zuffenhausen is 30 kg lighter than the V8, contributing to the Panamera’s relative light weight of 1,730 kg for a large luxury four-door. The Panamera and Panamera are genuine gran turismos, just like their V8 brothers, combining sporty driving with a high level of comfort. Final specification and pricing will be announced closer to the cars’ on-sale date in late July.